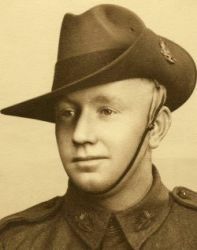 Hugh Archibald Patterson was born on 14 November 1907 in Nairne, South Australia , son of Hugh Ross Patterson and Evelina Mills. On 14 November 2007 Hugh celebtated his 100th birthday in Port Lincoln, South Australia . 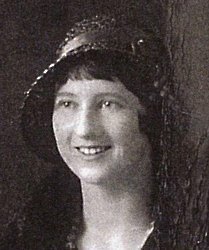 At the Church of St Mary of the Angels, Port Lincoln on May 8, the nuptial marriage was celebrated of Mary (Molly) third daughter of Mr. and Mrs. F. J. McEvoy, of Cungena, to Norman, only son of Mrs. and the late Mr. John Smart, of Minnipa. Rev. Father Kelly officiated. The bride who entered the church on the arm of her father to the strains of the wedding march played by Miss J. deLacy, looked very charm ing in ivory chiffon velvet, cut on empire lines with long pointed train, wide at the shoulders and tight fitting from elbow to wrists. A long trail of white gardenias and silver leaves trimmed the corsage. She wore a long tulle veil with a halo of orange blossoms, and carried a bouquet of deep crimson chrysanthemums and asparagus fern. The bridesmaid (Miss Ellie Mc Evoy) and the matron of honor (Mrs. A. Patterson) were frocked alike in. 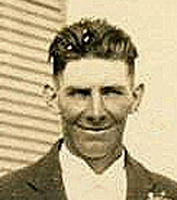 white matalasse cut on straight lines with long roll collars to the waist, long peaked basques fell to the back. A trail of white flowers trimmed the neck line. They wore satin girdles, and shoes to match. Small hats of silver lame with tiny white veils com pleted the outfit, and they carried bouquets of pale pint and white chrysan themums. The train bearer, little Hazel Patterson, niece of the bride, wore white satin with small frills edged with white bows. White shoes and socks to match were worn. The bride's mother was frocked in black uncrushable marocain with a small floral design, and hat and shoes to match. The bride's travelling costume was saxe blue wool matalasse with white velvet blouse, and a small white Russian hat. She wore shoes and stockings to match, and carried a blue handbag. The three-storey wedding cake was presented by the bride's sister, Mrs. C. Holland, of Courela. 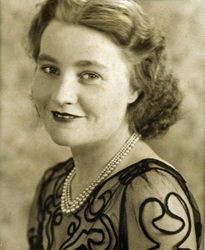 On 24 November 1936, Nora, aged 21, married Charles Joseph Holland, in the Cungena Hall in Cungena, South Australia . from the "The West Coast Sentinel"
A very pretty wedding was solemnised at the Church of the Holy Family, Cun geua, ou August 18, at 9 a.m., when Carmel T., youngest daughter of Mr. and Mrs. F. J. McEvoy, Cungena, was married to William M., elder son of Mr. and Mrs. G. A. Gill, of Poochera. The Rev. Father McCurtin officiated. The church was attractively decorated by friends of the bride in various shades of pink, mauve and fern. 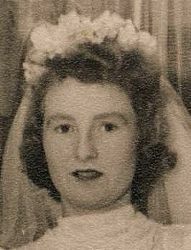 The bride entered the church on the arm of her father to the strains of the Wedding March, played by Miss Nellie Quinn. She looked radiantly beautiful in a high necked chiffon gown with long full sleeves banded at the wrists. The bodice and grateful tram were embroidered in cornelli-work. White gloves were worn and the tulle veil was held in place with a coronet of pale pink and white sweet peas. A sheaf of lilies, carnations and fern was carried. The bridesmaids, Miss Hazel Patterson (niece of the bride) and Miss June Gill (sister of the bridegroom) were charming in white organza, patterned with dainty pink sprays. The fitted bodices and short puff sleeves were off-set by frilled yokes. From peaked waistlines, the full skirts merged to deep gathered frills which con tinued up the skirts. The head-dresses were bonnets of old world style. The crowns and peaked brims were trimmed with frills, and the strings were tied in gay bows. Long white mittens were worn and posies of pink and blue sweet peas were carried. Each wore a gold pendant— the gifts of the groom. Mr. Albert Gill (brother of the groom) was best man, and Mr. Martin McEvoy (brother of the bride) was groomsman. As the bride left the church, satin "horse-shoes" were hung on her arm by her niece Jill Patterson and nephews Chris and Jonathan McEvoy. The bride's mother wore black satin backed crepe, relieved with white and black accessories and hat to match. The bridegroom's mother chose black satin backed crepe. Her hat was trimmed with pink flowers, and her accessories were worn to tone. Each wore a shoulder spray of pink carnations. The wedding breakfast was held in the Cuugena hall. Some 70 guests attended. A large crowd of friends attended the re ception in the Cuugena hall in the evening. The hall had been attractively decorated by friends of the bride. The Rev. Father McC'urtin, toastmaster, proposed the Loyal toast. Mr. A. Voumard submitted the "Bride and Groom," Mr. A. Mclnnes "Bride's Parents," and Mr. E. Voumard the "Groom's Parents." The three-tiered cake, made by Mrs. A. Trezona, was cut by the happy couple to the singing of "For They Are Jolly Good Fellows." Seventy-four telegrams were then read by the best man and groomsman. Cake ami wine were handed around by friends, after which guests were received by the bridal party. Dancing began, with the polonaise. During the evening Martin McEvoy rendered a vocal item—'When Irish Eyes Are Smiling." Many beautiful presents were received. For travelling the bride chose a beautiful aqua crepe frock. 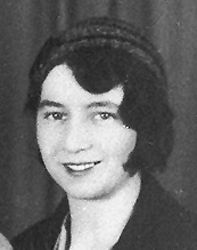 The attractive, feather-trimmed off-the-face hat of black with veiling, was attached to the shoulder.